De mascotte van het wereldkampioenschap voetbal in Brazilië 2014 is een (drieband)gordeldier. Het dier heeft de kleuren van de Braziliaanse vlag. Het beestje is geel met een blauwe staart en schild. Hij draagt een groene korte broek en een wit t-shirt met daarop de tekst 'Brasil 2014'. De keuze voor een gordeldier als mascotte werd gemaakt door de non-gouvermentele organisatie Caatinga. Deze organisatie zet zich in voor de bescherming van het milieu. Deze informatie vond ik hier. Het patroon is te vinden op Ravelry waar je zoveel meer moois kan vinden! My First Blog in English! This is the mascot of the world championship soccer. You can find the pattern on RAVELRY, it is in Dutch (!). 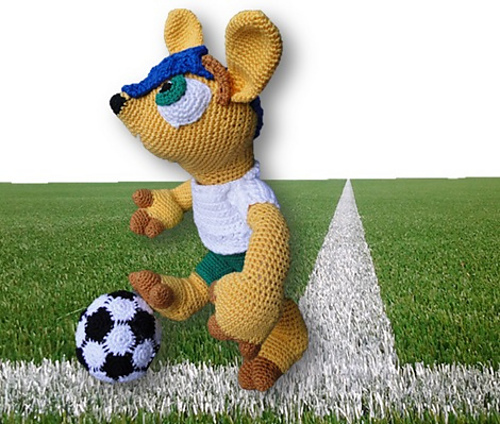 Fuleco the Armadillo is the official mascot of the 2014 FIFA World Cup in Brazil. It is a Brazilian three-banded armadillo, a species of armadillo which is native to Brazil and categorized as a vulnerable species on the IUCN Red List, it was officially launched as part of Brazilian broadcaster TV Globo’s weekly Fantástico entertainment show on 25 November 2012. He is a likeable character - he scores 7.3 out of 10 on appeal. Research has revealed that he is seen as an appealing character widely thought to represent the words, 'Brazil', 'Nature', 'Friendly' and 'Passion for Football'. It is a portmanteau of the words Futebol (football) and Ecologia (Ecology). 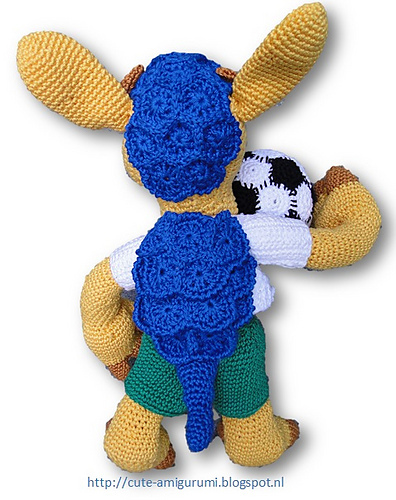 The name Fuleco was chosen over the names Amijubi (Amizade - Friendship and Júbilo - Joy) and Zuzeco (Azul - Blue and Ecologia - Ecology) by more than 1.7 million football fans. The mascot, with its message of environmental concerns, the ecology and the sport turned out to be very popular with football teams around the world. I found the information here.